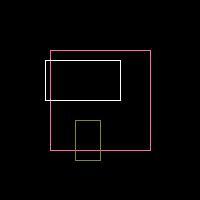 imagerectangle() creates a rectangle starting at the specified coordinates. Upper left y coordinate 0, 0 is the top left corner of the image. If you don't pay attention, you might thing that the difference between the two coordinates is exactly 100 and assume that the drawn rectangle would have the dimension of 100 x 100 pixels too. But it would be 101 x 101, because PHP counts from 0 and imagerectangle() uses absolute coordinates for the second point too. A smaller example: A rectangle with coordinates 0,0 and 5,5 means 0,1,2,3,4,5 which are 6 pixels, not 5. Oh I don't know. He was on the right track.. If you want an empty rectangle, I mean, just the borders, fill it first with the ImageFilledRectangle function with the background color and then draw it with this function. // With this function you will draw rounded corners rectangles with transparent colors. // Empty (not filled) figures are allowed too!! I agree that drawing 100 boxes for a 10x10 square is ludicrous. However, if we're going to talk about the best way to draw it in GD, you're still off. Since a rectangle will draw two vertical lines in one draw, we should use it to our advantage. You can draw 5 rectangles that have the tops and bottoms outside of the image, and there you have your ten rows. Draw 5 more who's sides are out of the image and you have your columns. We just drew a 10x10 (you could do 11x11) grid in 10 draw operations. Lets not do it Mr Benson's way OK! I'm sure if I had to draw a 10x10 grid on paper I wouldn't do it by drawing 100 individual squares, redrawing nearly half of the lines twice. I'd probably do it by drawing 11 vertical lines and 11 horizontal lines.